Al-Aman Fund for the Future of Orphans, one of the initiatives launched by Her Majesty Queen Rania Al Abdullah, received funding for 7 scholarships from the Tasali Jordanian Trading institution, agents of Indomie Noodles, Tohfa rise and Tuna Sayad, which came in response to the campaign launched by the fund earlier this Ramadan. 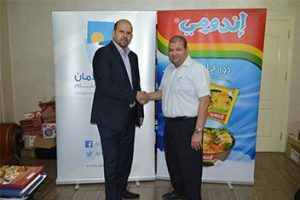 The General Manager of Tasali Jordanian Trading institution Mr. Ehab Al Shurafa explained that the scholarships will cover the educational expenses for 7 of the funds’ beneficiaries, adding that the initiative aims to help orphans graduating from their care centers to become self-sufficient and realize their full potential. Al Shurafa emphasized the importance of the role played by the private sector in developing local communities, particularly in the arenas of foster care and education, in line with the royal vision which calls for seamless public-private collaboration. Al-Aman Fund for the Future of Orphans is an independent non-governmental organization founded in 2006 by Her Majesty Queen Rania Al-Abdullah and registered under the Ministry of Social Development. The fund equips orphaned youth who, upon reaching the age of 18 leave their orphan care centers, with the education and skills necessary to become successful, self-reliant and productive members of society. This is done through five support schemes designed to meet their needs, spanning educational scholarships, coverage of living expenses, counseling, apprenticeship and employment, in addition to health insurance.